« The Age does award winning PR — oops was that meant to be science? Ocean pH varies by 0.3 naturally. Claims of acidification since 1750 are based on dubious models and few observations. Ocean life evolved and survived far higher levels of CO2 for millions of years in the past. Marine organisms actively create carbonate shells (using energy) which means crustacea, corals and molluscs aren’t automatically prey to pH changes in the same way that say a limestone rock would be. The world’s oceans may have warmed a mere 0.17C since 1955, hardly a significant threat to marine life. The water molecule is comprised of three atoms – two of hydrogen (H) and one of oxygen (O). Each of the hydrogen atoms is linked to the oxygen atom by a chemical bond, and hence the water molecule is symbolized as H2O, see picture below. At 25oC, in the case of a very small number of water molecules, one of the hydrogen atoms breaks off (dissociates), thereby forming equal numbers of two charged species, a negatively charged hydroxide ion (OH-) and a corresponding positively charged hydrogen ion (H+) called a proton. The size of the respective charges is equal to that carried by an electron. Notwithstanding this dissociation, nearly all of the water continues to exist in the form of the water molecule, H2O. where [H+] is the (molar)1 concentration of protons. Because the molar concentration (M) of protons in pure water at 25oC is 10-7 M, the pH of water is 7. Thus a pH value less than 7 refers to an acidic solution, whereas a value higher than 7 indicates a basic solution. As indicated by the two-way arrows (⇌), this chemical reaction is reversible; water and carbon dioxide generates carbonic acid which also breaks up (rather slowly) to regenerate water and carbon dioxide. The equilibrium lies to the left so that there is much more CO2 dissolved in water than H2CO3. The amount of CO2 that is dissolved in water depends on the temperature of the water, and on the concentration present in the water and the pressure of CO2 in the air above the water. The warmer the water, the less CO2 will dissolve in it. Because cold water will absorb more carbon dioxide, it follows that if water containing dissolved CO2 is warmed it will release CO2 into the air. (Consider the effect when a warm bottle of beer is opened!) The more CO2 that is present in the air above the water, the more CO2 that will dissolve. The bicarbonate ion, HCO3-, can also dissociate its hydrogen atom to give a proton and the carbonate ion, CO32-. Carbonic acid and the bicarbonate ion are said to be weak acids because, unlike hydrochloric acid in water solution, the hydrogen atom is not fully dissociated. For slightly complicated reasons carbon dioxide dissolved in water will generate; H2CO3, HCO3- and H+. Because of the presence of the proton derived from carbonic acid [equation (3)], water that has been exposed to carbon dioxide in the air will be mildly acidic, about pH = 5.7. Raindrops become acidic for the same reason. The figure below shows the fraction (alpha) of various species in solution with varying pH. At lower pH more carbonic acid is present (left), at higher pH more carbonate exists (right), at about pH 8.5 the maximum fraction of bicarbonate is present and at this pH it is essentially the only species present. The pH of sea water can be measured2 although there are complications due the presence of dissolved salts and other factors. On average, surface sea water is mildly basic, about pH of 8.1, although the measured pH can vary by as much as 0.3 pH units at different times in the same area and from area to area. There is a mathematical relationship between pressures of CO2 (pCO2) and the resulting pH of pure water3. This relationship is the basis for the calculation of ocean pH values. Caldeira4 employed such a formula to conclude that the pH of the oceans had changed by about 0.15 of a unit since 1750. He assumed, without providing any empirical evidence, that the pre-industrial pH was 8.25. This work has been challenged because it is not consistent with observation3. The ocean is a very complicated system and does not yield to simple modeling. This reaction leads to the destruction of calcium carbonate. The alarmist argument asserts5,6 that were the oceans to become progressively more acidic from increasing amounts of carbon dioxide released in the air, the exo-skeletons of organisms (corals, shells, and other calciferous organisms) might be dissolved by the process shown in equation (5). Whereas in principle this may be true there is no conclusive evidence that this process is occurring to any measurable extent, despite the almost universal public posturing of marine biologists. During past periods, stretching back millions of years, atmospheric carbon dioxide levels have varied enormously7; at times reaching concentrations far exceeding those at present and those projected over the next 100 years. Yet during these times of differing carbon dioxide concentrations, calciferous sea organisms continued to thrive. Whereas it is true that there have been “boom and bust” periods for corals and other calciferous sea organisms, the “boom and bust” events do not correlate with the concentration of carbon dioxide in the atmosphere8. Incidentally, there is also no correlation with temperature. Consistent with these historical observations are the reported experimental studies9 that show that calciferous marine organisms are much more immune to the effects of ocean acidification than is usually supposed. In fact these experiments suggest that even for some of the extreme projections of ocean acidification most of the organisms are likely to survive or adapt. It should be noted that the shells of coral and those of other organisms with calciferous exo-skeletons are not formed spontaneously by the reverse of reaction (4). The calcium carbonate of their skeletons is laid down by a process called biomineralization10,11, where the organism actively (uses energy) lays down the calcium carbonate in a precise way about itself. (It is amusing to note that over 95% of spiral shells are right-handed, a morphological manifestation of the biomineralization process. Were the calcium carbonate laid down spontaneously, equal numbers of right- and left-handed shells would form.) It is conceivable that the biomineralization process could counteract any decomposition that might occur by a mild acid such as carbonic acid. There is still much to learn about the response of the oceans to increases in carbon dioxide and how organisms with calciferous skeletons respond to small changes in pH that ensue from the formation of carbonic acid. The other concern for all organisms in the oceans is the consequences that may follow from an increase in temperature. The figure below is said to show the variation in ocean heat content from 1955 to June, 201112. It will be noted that from 2003 to present there has been no change in ocean heat content. It is precisely during this time that the accurate Argo buoys13 were fully deployed! Before this (1955 to 2003) the data was obtained by less accurate methods (expendable Bathythermographs14) that only covered the world shipping lanes. The Argo buoys, by contrast, cover the whole of the oceans except under the sea ice at the poles. It is tiresome but straightforward to calculate the change in ocean temperature from 1955 to present from the above graph. The result is that over this time the temperature has increased 0.17oC! (I thank Dr William Kininmonth for confirming the result of this calculation.) One can accept this change and be forced to conclude that there has been very little change in temperature. In fact, it is more probable that the apparent change in temperature falls within experimental error, meaning that it cannot be said that there has been a change in upper ocean temperature. Marine organisms appear to be safe from ocean warming. Similarly, most of these organisms are very likely to be safe from the supposed effects of possible ocean acidification. It has been noted that the Australian coral reef would benefit from an increase in sea temperature15. Acknowledgement. I am grateful to three people for reviewing a draft of this piece. Two are intelligent non scientists, the other although a scientist is not a chemist, but is also intelligent. They made valuable suggestions to improve and make accessible this piece. The problems that remain are my own. This may be the first time that peer review has been used for the Jo Nova blog. Could this mean that the alarmists will now accept her, I hear you cry? (1) Molar Concentration — definition. (3) Marsh, G.E., (2005) -- SEAWATER pH AND ANTHROPOGENIC CARBON DIOXIDE (PDF) First chapter in Climate Change, Ed: Siddhartha P. Saikia (International Book Distributors 2010). (11) Hofmann, G.E., O’Donnell, M.J., and Todgham, A.E. (2008) Using functional genomics to explore the effects of ocean acidification on calcifying marine organisms, Marine Ecology Progress Series, Vol. 373: 219–225. (12) National Oceanographic Data Centre, NOAA, Global Ocean Heat Content (0-700m). (13) About ARGO: The Argo array is part of the Global Climate Observing System/Global Ocean Observing System GCOS/ GOOS. Professor Brice Bosnich FRS, is Gustavus F. and Ann M. Swift Distinguished Professor in Chemistry at The University of Chicago, Emeritus, and is currently a Visiting Fellow at the Research School of Chemistry, The Australian National University. Prof Bosnich was elected Fellow of the Royal Society in 2000. There is ocean differences of salinity in the equatorial latitudes that have been increasing the surface salt content and yet in the higher latitudes there are fresher water. These have been occurring for the last for decades. Recently our planet’s velocity has been mapped which shows a much more centrifugal force at the equatorial region which can be the partially the cause of these changes. Could you give your opinion on this? You are assuming that “more neutral” = more good. As discussed in previous threads (how I appreciate Prof Bosnich adding the reversible arrows)the ability to cope with change depends on a lot of factors. You can assume that all present day species are competitively adapted to the present pH (if they were not they would become extinct quickly). The green argument is that human induced climate change will resuilt in rate of change in pH at a rate that outstrips the creature’s/plant’s/protist’s etc ability to adapt via evolution (ie over a number of generations), or beyond its pre-existing plasticity, and will therefore cause calamitous damage to the ecosystem. Unfortunately in most discussion on this topic we see far too much simplification and rhetoric. For example, the fact that oceans had much different pH in the past says nothing about the response of present day biota to a rapid change. The coral living in acidic oceans are not the same coral as living today (rhetoric but supportable). As for me, I agree with Jo and the professor that change is likely to be minimal. That is my position on climate change in a nutshell. I also agree with the greens (and every marine biologist on the planet) that if change is rapid we will see big changes to life oceans. Gee Aye your argument is baseless. Marine organisms often deal fairly with large changes in pH and temperature over a single day. The marine biota is the same as it was 12,000 years ago when the sea levels were 120m lower and temperatures 10C cooler. Many marine organisms have remained unchanged for tens or even hundreds of millions of years. They are not going to adversely affected by absolutely trivial changes in pH or temperature over decades. ok… you must be right. How could I be so stupid. By the way. Biota moves and the changes were big. In other words, you are wrong. Most of the so called “ancient” environments worshipped by Greenies are only a few thousand years old. The modern Great Barrier Reef is only 7000 years old. (It was also warmer 7000 year ago than now). The climate constantly changes and nature adapts. correct! So changes occur and the changes in biota are consequently big. You must be the one who gave me the thumbs up in my earlier statement noting this fact. What you say makes a bit of sense i as you are in agreement with Jo and the professor. My question would be that when you consider the volume of the ocean and then estimate the maximum possible CO2 level assuming we burn all the coal down to the last ounce is it possible for the PH to change much at all? If ‘modern’ corals can survive direct exposure in air to the sun at low tides, rapid changes in salinity through flood, rapid changes in water temperature due to thermoclines, as well as local variability in water chemistry, why would they not adapt equally as well to the slow change of climate? I have many years first hand experience in coral propagation in captive environments so I have some understanding of the science and the daily ‘reality’ that I see before my eyes. This is the second time we’ve had an article by Prof Bosnich, and doesn’t he write so clearly and conscisely? Wish I had him as a teacher. I’d like readers to make a further consideration. Take 2 bottles of beer, one nice and cold from the fridge, and one English beer, crappy and warm. Now open the warm one and hear the initial fizz, confirming the above quote. Set it down to see how long it takes to degas. Now open the cold one, but instead of setting it down, start shaking it. I’ll bet all the warm beer in London that the shaken cold beer will go flat first. Why is this important? Consider the terrifying open sea conditions at the lower lattitudes where the oceans are cooler. There’s a whole lot of shakin’ going ’round there. By contrast, the warmest parts of the ocean, the tropics, host the well documented areas know as the “doldrums” where the sea is literally flat. Not shaken, not stirred. The point is, most of what we experience in labratory conditions (be it acidification of oceans or radiative properties of molecules) bears little resemblence to the ruff gruff chaotic unforgiver that is Gaia. The oceans are nothing like a shaken beer bottle. The oceans are 4000m deep and even the worst storms only mix the top few metres of water. They are not going to effect overall gas exchange in any meaningful way. In the deep oceans water circulation is almost non-existent and the temperature is a constant 1.6C. I disagree nana because of the vast density difference between the 2 mediums. The ocean depths have a distinct lack of dissolved gasses, be they CO2 or Oxygen and nor does it interract directly with the air above, so it’s the top few metres that’s relevant to the (de)gassing discussion anyway. English beer is not crappy and warm. Real English ale (as distinct from the multi-national crap) is delicious and is best served at cellar temperature. Cold beers do not have the taste of real beers served at cellar temperature. Also may be pressurized with nitrogen, not CO2. Lager is carbonated. Real Ale must NOT have added carbonation or nitrogen. Real ale is naturally carbonated by the secondary fermentation process at the point of sale usually the pub. The ale is casked at the brewery and sent to the pub before the yeast has consumed all the fermentable starches and sugars. Thus the ale will continue to mature and complete the fermentation process whilst being served at the pub. The resulting ale will also change flavor profiles right up to the last pint served. Apparently if carbon dioxide doesn’t kill you one way it’ll kill you another. Next thing you know it’ll be responsible for the great obesity epidemic…or something even worse, maybe high cholesterol or cancer. If you’re into being scared to death all the time there sure is enough to do the job for you. The plebs (and ignorant media) already don’t understand carbon-dioxide chemistry. There is even less chance of being able to educate them about pH – oceanic or otherwise. We are in for another ‘scientific battle royale’ on this one too I think. I’m not the frustrated cynical observer of post 44…well not completely anyway. The oceans of this world are not simple bottles of beer on which a chemistry or physics teacher can do classroom demonstrations. They’re a complex soup of living organisms that has evolved over millions of years and have survived everything that was thrown at them, including, as has been pointed out, atmospheric CO2 levels much higher than today’s. The important thing here is that they are well able to buffer themselves to stay within a healthy ph range. And I don’t understand what’s so hard to understand about that. Again we have the ignorant and the malign running the show. if an organism is required to spend more energy maintaining its required internal environment because the external one has changed from what it is used to (ie there is an optima), this has consequences. That energy is then not available for feeding, reproducing, growing, excreting, running away from predators etc. This is what is referred to as stress. While life as such has persisted though many different conditions it does not mean that an individual life-form will do at all well during change. I’ll keep on about this until you all stop citing the falsehood of “the past was different therefore things will cope”. Better to debate on things where you have some facts. I’ll keep on about this until you all stop citing the falsehood of “the past was different therefore things will cope”. But the past has been different, and life on earth did cope (or adapt). How is this a falsehood, or ‘untrue’? How is it possible to attempt to predict future climate without understanding past climate ? Based on findings related to oceanic acidity levels during the PETM and on calculations about the cycling of carbon among the oceans, air, plants and soil, Dickens and co-authors Richard Zeebe of the University of Hawaii and James Zachos of the University of California-Santa Cruz determined that the level of carbon dioxide in the atmosphere increased by about 70 percent during the PETM. It was still carbon based life. This assumption that somehow change of even modest degree is to be avoided or circumvented is predicated on an idea that organisms are only adapted to a tiny range of environmental conditions- rubbish. Nothing in what has been suggested as a result of CO2 increasing in the atmosphere suggests anything is “changing” rapidly enough to be of any consequence, especially when one takes into account variations of temperature or pH with depth or latitude or time of day or season of the year etc. Should read “CO2 Hysteria”- need to proof read also. Winston, maybe you have a point here with hysteresis. Maybe the Earth’s magnetic flux is having an effect on people’s thinking. The precautionary principle suggests we should all protect ourselves against catastrophic runaway hysteresis, so what could it hurt? ‘catastrophic runaway hysteresis’ is something that will never happen with Global Warming. Magnetic fields are the strongest with colder temperatures. Zero K (Minus 273C) is supposedly where magnetic fields are strongest. That’s why most modern large scale electrical power generators are supercooled, so that the field in the rotor is at its strongest. Incidentally, with respect to magnetic fields, (and in a way here, I suppose some people will think of me as a tinfoil hat wearer for actually saying this) it’s a little known fact that people actually sleep better with their bodies aligned North South with the head at the North point. Supposedly it aligns the bodies inherent magnetic field with the Earth’s magnetic field. Can someone make an argument without any straw men? Tony..Magnetic fields are strong at cold temps when the source is cold NOT the fields containing them. The source currents need cooler conductors the H comes from the I not the reverse. … it does not mean that an individual life-form will do at all well during change. That depends on your definition of “individual”. If you mean one specific specimen of a life-form, and a very rapid change, then I might agree with you. But if you mean one specific genus, and a slow change, then I almost certainly will not agree with you – a small matter of adaption? It is not change per se that is the problem, it is the rate of change that we need to be concerned with. Any change in climate that takes longer than a generation is unlikely to have any detrimental affect on a life-form. In other words you agree. I did not specify any parameters as you note. Indeed. It is easy to agree with any statement that has no substance. The point is that climate changes, always has, and always does, as does the chemical balance of sea water. The rate of significant change is measured over a timeframe that is longer than several generation of most organisms, and so they have time to adapt, and adapt they do. Your original comment at 6.1, “This is what is referred to as stress“, is a falsehood by association. If you are going to keep use propaganda techniques on this site, you had better sharpen your game. You are starting to annoy the professionals. Homeostasis and then there is Allostasis. One is the permanent solution to a variation in our “environment” that is temporary and the other is a temporary solution to a change that is permanent. Without one we wouldn’t have the other and consider that without either of these processes we, and other life forms, wouldn’t be here. There appears to be a suggestion coming from Gee Aye that there is something immoral or unethical about change and hence survival? Why. This is a religious issue , why not talk it over with your priest or local member for Greenp$ace or WWF. After all is said and done we’re left with this: Water containing CO2 turns acidic, not alkaline. Sea water in open ocean remains alkaline. This can only happen if something acts as a buffering agent to keep the ph in the vicinity of that magical 8.1 or 8.2. I don’t know how you can argue this down. Numbskull suits me better. Fingers don’t work well and I don’t proofread well either. Post 44??? You can’t think of the CO2 in the oceans without thinking about the bi-carbonate and the calcium (and to a lesser extent the magnesium) in the system. Calcium bi-carbonate, Ca(HCO3)2, has a much higher solubility than Calcium carbonate but the calcium bicarbonate is not stable in warm water. So when cold water water containing Calcium bicarbonate wells up or is carried to the lower latitues by currents, the calcuim bicarbonate decomposes to calcium carbonate (which precipites out in warm shallow seas, settling on the bottom) and CO2. So half the CO2 is sequestered and the other half could potentially be re-emmitted to the atmosphere. So if you have more warm water in shallow seas, you actually speed up the amount of CO2 that could be sequestered as limestone. surely if CO2 is making the oceans more acidic/less alkaline the inland rivers and lakes must be doing the same. Is there any evidence of this? Could you comment on the infamous Tans 2009 and his ostensible concern for ocean pH reduction? His paper is located here. I attempted to diagnose a contradiction between his method and his conclusion in an old comment of mine here. I have wondered if my doubt was simply due to a lack of chemical expertise or whether the contradiction is real and significant. In other words, if his equation is fine it would not justify his claimed level of concern. One of the greatest advantages the climwits have had, and continue to have, is their ability to frame the language of the debate, and have all the naive skeptics just follow along like sheep. The outstanding example of course, is use of the term “climate change” instead of Catastrophic Anthropogenic Global Warming (CAGW). The debate was, is, and will continue to be about CAGW, and yet, time and again erstwhile intelligent people, including commenters here, have taken to using the entirely misleading, and meaningless term “climate change”, instead of CAGW. “Ocean acidification” is another example. It is simply not possible to “acidify” the ocean, not even if all the fossil fuel on earth was burned tomorrow. But it sounds so much more scary than “lowering the alkalinity (slightly)”. It is a pity the the learned Professor has sullied this otherwise excellent article by referring repeatedly to the process of “ocean acidification”. In the words of one who tried to warn us about this a long time ago, use of the term is doubleplus ungood. And the MWP is unpossible. Not only is it deemed in the present to be impossible, but all evidence of it is erased and the historical record altered to make it look like it never happened. Andrew, Andrew, Andrew, haven’t you been reading the posts of our learned troll Gordon? The MWP ispossible and happendid. It was just “localised” is all. Current “consensus climate science” maintains it occurred at what is now the site of the Nuuk Golf Club, Kitaa, Greenland, on a balmy Thursday afternoon, mid-August, in 1105AD. Incontrovertible evidence of this can be found in a soon-to-be published, peer-reviewed, scientific paper by a Greenpeace advocate IPCC Lead Author who recently graduated from high school, and is based on a computer simulation of the probable rate of deterioration of a Bristlecone Pine splinter should one have ever become lodged in a Viking Berserker’s boot. The software program itself was based on the same algorithm as that used to generate the overlay graphics in World of Warcraft, and since far more people play WoW than give a hoot about the weather, by sheer weight of numbers it MUST be true. He can’t really be a skeptic though can he? I mean after all he enjoys considerable respect for his scientific endeavours and now having effectively retired is welcomed back at ANU, Australia’s leading university. Isn’t there meant to be some sort of silencing conspiracy against this kind of guy? No sense of humour oggi? Maybe tomorrow. Is really an irrelevant statement… I’ve said it before but because yesterday there was a bullet 1 foot to the left of me, and next day it is 1 foot to the right of me, concluding that shooting that bullet from one side of me to the other will have no adverse health effects would not be a satisfactory outcome (to me). Tee issue is the rate of change. Similarly there are plants at the top of mountains, and there are plants at the bottom of mountains… but clearly moving a plant from the top to bottom or vice versa would not be great for the plant. So just forgetting the rest of the argument, the statement I highlight is pointless and irrelevant. Which, of course, might be meaningful if there was the slightest bit of evidence that the rate of anything was happening at a rate significantly higher than in the past. Here is the global temperature record from 1880 to 2000, broken up into 30 trend segments (thirty years being (roughly) the warming/cooling cycle as recognised by all but indoctrinated climwits). Seems to me that the warming trend 1970 to 2000 (the period that gives rise to all the climwit hysteria), is remarkably similar to that for 1910 to 1940. Which sort-of makes your statement (and the background hysteria it is founded on) far more irrelevant than the one you are attempting to denigrate. the measured pH can vary by as much as 0.3 pH units at different times in the same area and from area to area. log 2 = 0.3 pH units; therefore Oceanic pH or “acidity” can double or halve with a pH change of +/- 0.3 in the same area and still be “normal” or consistent with all of the life that’s usually present in that area, if I’m reading the “vary as much as 0.3 pH units” correctly. Regardless, the pH of the Ocean can vary quite dramatically and still be “normal”. Compared to the Climate Science doomsday senario of a pH change of only minus 0.2 down from 8.1. Or up? [Punch line in the next paragraph] The normal pH of the human body is around pH = 7.41 – 7.43, much more “acidic” or less basic than Ocean water. Actually, control of CO2 concentration in the human body via breathing is the first mechanism employed to control human body pH, which is critical in relation to the needs of the body’s normal physicochemistry which keeps us alive, usually by “ventilating” off excess CO2 to the atmosphere, such as with exercise, but always operating instantaneously via CO2′s effect on the brain’s “respiratory center” which then automatically adjusts “respiratory/ventilatory rate” and CO2 concentration and pH back to where it’s optimal. According to Professor Bosnich’s equations 2 and 3. CO2 concentration is what usually controls H+ concentration in normal conditions. But the punch line here is that body partial pressure of CO2 = pCO2 = 44-40 [44 when the venous blood is mixed before entering the lungs then adjusted within the lungs before returning to supply the body at pCO2 = 40] = 5.6% of total gas = 56,000 ppm, approximately, vs 385 ppm in the atmosphere! Several things occur to me. 1 The chemistry presented is simplified, and it’s always possible that the simplification is relevant. Nothing above lends weight to this conclusion. 2 Last time this was “argued” I vaguely pointed out that the entire question is one that is amenable to experimentation. Anyone here could do the experiment for themselves, with a reasonable pH meter and a big fish tank. Does anyone seriously believe that with many billions of dollars of tourism centered on the great barrier reef alone, the experiments have not been, are not being and never will be done? This is a theoretical model based argument presented in lieu of actual evidence. Some may call that ironic. And your prepared to conduct said experiment over a 20 year time frame at the minute incremental changes in atmospheric CO2 in that time, in a fish tank large enough to allow convection via ocean currents or tidal movements, a depth suitable enough to mimic the depths applicable to the open ocean, with variations in atmosphere to mimic the effects of storms, wind, plus variations in sunlight and temperature? The fish tank microcosm as any guide to pH changes in the open ocean or in bays, inlets, estuaries, etc seems far too naive and simplistic to be seriously correlated to the realistic situation as it occurs in nature. a. The sources of Calcium in the ocean are, inorganic CaCO3, Ca2+ ions, organic CaC03. b. As pointed out organic CaCO3 is maintained against an energy gradient. d. At depth CaC03 is likely to precipitate out (for various reasons). Therefore there is a net pump of Ca and C02 from the ocean shallows to the ocean depths. e. Increased atmospheric C02 necessarily increases the gradient, therefore the dissolution rates of all forms of CaC03, ultimately there is a degree of loss of both organic and inorganic CaC03 in the shallows, to the depths. Each of these steps can be tested fairly easily. I agree that a whole of system experiment is the ultimate. That’s what we’re engaged in right now. Do you have access to data taken by experimenters who decreased the pH of water by dissolving carbon dioxide and finding dissolution of calcium carbonate. If so, please provide a citation. Every such article that I have seen refers to experiments wherein a mineral acid, usually HCl lowered the pH. Of course carbonate dissolves when a mineral acid lowers the pH. I maintain that carbonic acid will not dissolve calcium carbonate. I’ve been past fish tank experiments which I was told were testing that. I’ll see what I can locate as public peer reviewed papers. The carbonic acid /chalk/water equilibrium reaction is what the formation of stalactites is attributed to. C02 rich ground water leaches chalk(CaCO3) to produce an amount of Ca++ and HCO3- which reverts to CaCO3 as the leachate dries in a cave. I did that experiment as a 13 YO years ago. A bit of chalk powder, a sparklet bulb, a lemonade bottle, funnel, filter paper and good scales borrowed from a sympathetic science teacher is all that’s needed. The mass of lime powder in the filter paper after immersion in carbonated water is detectably less that in tap water; although I can’t swear that a 13YOs experimental techniques are adequate. I would have thought that in a sodium chloride solution a very small amount of HCl would make its presence felt only by the H3O+, but I also agree that this is an assumption which should be ruled out if possible. Not much yet. Most stuff is behind paywalls. A much better summary of the basic chemistry is in this. Time frame is the most important variable in the experiment IMO, making your beaker of HCL and small fish tank fairly unlikely to provide a parallel with reality. For an experiment to have any validity it has to at least approximate the situation upon which you are drawing comparisons and conclusions. If the experiment is at great variance from the real world situation, and the experimenters are inclined to over- value their conclusions as being more correlated to reality than they are, then yes, it has nothing of value to add. In fact I would argue that it may divert further from reality because they are ignoring the most important variable, which dictates primarily if there is an effect at all. In other words, a poorly designed experiment tends to give erroneous or misleading conclusions. A very informative article which I have shared with others..
As regards homeostasis – the mistake is assuming its one point defined by one variable (in this case Co2 concentration). Its much more likely its a range of interrelated variables that can be made to form a surface. Some of those variables the life form is able to effect (either consciously or automatically). The point is we have evolved mechanisms to deal with a range of environments and so adjust exactly where homeostasis occurs. I’d put good money on it that other lifeforms have done exactly the same thing. Given that we seem to have been able to deal with a doubling of Co2 levels in the atmosphere to no ill effect (I think we can go up to 8000 pmm before it starts to become an issue – some NASA research comes to mind), I think its highly likely life forms in water can deal with the current small changes as well. If we accept the theory of oceanic acidification as promulgated by the IPCC then during the Ordovician and Permo-Carboniferous periods where atmospheric CO2 was significantly higher than today the pH of the oceans would have been like battery acid and killed everything in it. Tom Segalstad submitted a good video to YouTube some time ago showing that as CO2 is dissolved into the oceans it reacts with calcium to form CoCO3 and this precipitates inorganically which acts as a buffet and keeps the oceans Ph stable at about 8. See here: http://www.youtube.com/watch?v=sjxUwDTkd4g&feature=player_embedded Apparently the IPCC ignore this chemical reaction, which allows them to come up with these dire scenarios of species going extinct. Another thing worth pointing out, is that according to the IPCC, the oceans have only absorbed about 10% of anthropogenic CO2 (or 100 gigatonnes of carbon/13ppmv) in total because of the so-called Revelle Factor, which is nothing. Yet, this small amount of CO2, we are to believe, is procuring a global catastrophe? If you go to Wikipedia’s Henry’s law page, you’ll see an equation for calculating CO2′s solubility coefficient at different temperatures in water. According to NOAA, the SST have increased, give or take, by about 1C since 1910. Applying the equation to the surface of the oceans, which contains about 1000 gigatonnes of carbon (corresponding to 3670 gigatonnes of CO2) we find that about 14ppmv have been out-gassed into the atmosphere due to the 1C increase in SST. So, there is actually less CO2 in the oceans now than what there used to be! If you think that a saturated carbonic acid solution is as corrosive as battery acid then avoid like the plague such things as soda water and beer. The conclusion that calcium carbonate will become less soluble as carbon dioxide dissolves in sea water has never made any sense to me. The calcium carbonate in the seas is the result of precipitation of carbonate ion formed by dissolution of carbon dioxide with calcium ion, contributed by river water. As I recall, the solubility product constant concept describes the solubility of sparingly soluble compounds. As you displayed in your discussion of the ionization of carbon dioxide in water; the carbonate ion concentration increases as the pH decreases. Dissolution of calcium carbonate would be in equilibrium with the re-formation of calcium carbonate. There should be no net loss of calcium by the shells of critters. Even though, as you say, the formation of calcium carbonate by marine life is by an energy-using biological process and not by simple chemical precipitation, it makes no sense to be that increasing the concentration of one ion of the subject compound would dissolve that compound. I do agree that adding a mineral acid, e.g. HCl would dissolve calcium carbonate. But adding carbon dioxide is different. Thank you Jo for this excellent post on a very important subject presented by a specialist. I love these posts. It is taking the CAGW alarmism the wind out of their sails letting the people concentrate on real science. Well yes, asteroids the size of Manhattan tend to do that. Species in isolation tend to not adapt well to environmental changes, but abundant species tend to adapt given enough time. how much change is required over what time frame to extinct all coral? Likewise, if the range is 4 degrees C, and it takes 20 generations to adapt, and a generation of coral is 1 year (they spawn annually IIRC), then for coral to become extinct, ocean temperatures would need to change by More than 4 degrees C in 20 years to make all coral extinct. What odds would a bookie give me of that? Ferchrissakes you quite clearly have NO IDEA what you are talking about when it comes to the lifecycle of coral reefs! No need for a degree, just a quick google can tell you that most corals reach sexual maturity after 8 years. Mate I can spawn every night and twice on tuesdays it doesn’t mean a generation if humans ticks over on a daily basis. Even if you WERE right in 20 years you’d just have a heap of tiny new coral fragments which would provide zero habitat for any species of note resulting in total collapse of marine ecosystems globally. Seriously next time, follow this routine. No need for a degree, just a quick google can tell you that most corals reach sexual maturity after 8 years. Only the giant and long-lived species Favia Doreyensis has a sexual maturity age anywhere near 8 years. We don’t know the age of sexual maturity for poor old Porites, but given that they only have a lifespan of 1 to 3 years, it can be safely assumed it is somewhat less than that. Corals spawn – or bud – at least once a year after maturity, many do it more often (randy little polyps), so if we adjust Twodogs statement to read “by more than 4 degrees C in 23 years to make all coral extinct”, and it puts him pretty much on the money. As an aside, while it is comforting to hear that you can still “spawn every night and twice on Tuesdays”, rest assured there will come a time when it takes you all night to do what you once did all night. As an old man, in this I speak from experience. Sorry, I am not remotely interested in your sexual proclivities. Yes, I didn’t bother to google, but I do have to work too. Let me put it another way. if global warming raises temperatures 1 degree C in 20 years (alarmingly! ), and el niño or la nina events swing 2.5 degrees C in that time, which will more likely cause coral bleaching? The 1 degree or the 2.5 degrees? The noise or the variation? duh, your own link says this: In Australia’s Great Barrier Reef, more than 100 of the 400 plus species of corals spawn simultaneously within a few nights during spring or early summer (Willis, B.L. et al., 1997). So it is likely that any of a particular specie is developing each and every year. Thus the issue of age to sexual maturity is moot. It would be the newborns that have to adapt not the mature parents. As pointed out by others, it is not simply generations that count, but volume of spawn unless they are clones, which they are not. What changes would kill mammoths would be a walk in the park for microbes. More to the point, a gradual climate change is far easier to adapt to than a relatively sudden severe el niño event. Twodogs – you’re the one who made the fuss about generations… but now they don’t count? Homeostasis? sure tell that to the gray squirrels out my front door. Their homeostasis REQUIRES that they spend additional energy preparing for our impending winter. They’ll manage through -40F. and next summer they’ll be running around in over +100F. Precautionary principle meet real Homeostasis. I think that they (warmists) have a conflicted faith in evolution. The entire globe has gone through more change than we can get out minds around. The oceans are fine with co2, the oceans are fine with temperature change. I have just come back from the great barrier reef and the Daintree Rainforest, and from a laymans perspective, both ecosystems are thriving. The Daintree is, in fact, expanding. MadJak, I’d love a visit and I don’t doubt (am not in denial) that the great barrier reef and the Daintree Rainforest are thriving. The only way nature doesn’t thrive is when we look back in time and make agenda driven assumptions. Notice that the outcomes of modern human impacts are ALWAYS bad. The twisted Malthus would be proud. We should be ashamed. I’ve noticed a great number of young people can’t feel shame, don’t know shame. Ah but back to me making a visit! Thanks for the reminder. As a chemist/chemical engineer (both), I agree with the Professor’s lucid description of carbonate chemistry. As much of the discussion here indicates, the real situation is much more complicated. One might draw a parallel to the greenhouse effect and the chaotic system that is the atmosphere. The ocean system is also chaotic and the impact of changes at the ppm level in atmospheric CO2 has not been predicted accurately, nor can it be until those studying it forgo agenda-driven science. Andrew, I will look at Tans’ paper and the associated chemistry on the morrow. However, my point is that the basic chemistry of CO2 impact is complicated by oceanic variables that affect pH directly and the pH buffering capabilites of the bicarbonate/carbonate equilibria. Temperature, mixing, salinity, calcium/magnesium concentration, etc., are but a few of the properties that affect ocean “acidity” and I do not believe they have been adequately accounted for individually, much less in combination to determine their effect on fixed and mobile carbonate shell aquatic life. To me, this is a chaotic system. And the evidence of the impact on life is simply not there, we MUST depend on evidence and not theory that happens to support our views. Andrew, I have looked over Mr. Trans’ paper and, to his credit, he does an accurate (although not as lucid as Professor Bosnich) job explaining the effects of CO2 on carbonate/bicarbonate chemistry. However, please notice that on page 34, Figure 5 and all of the equations he cites are specificaly for “average ocean surface waters.” One can expect the surface waters to be in equilibrium with atmospheric CO2, however, a concentration gradient of diminshing CO2 with depth will also be established. It is like trying to determine the average ocean temperature by measuring just the surface temperatures, we know that is not correct. The uptake of CO2 by the whole ocean will be affected by the factors I mentioned in my second post. In fact Trans says on page 34, “Other uncertainties mentioned above, such as changes in ocean circulation and ocean biology, have also been ignored because they cannot be credibly predicted at this time.” That is like saying you are ignoring the effect of El Nino on temperature because you can’t predict it in your models. You’ve essentially admitted you can’t account for the most major factor in detemining the temperature on the West Coast. So you concentrate on the little things that don’t have that much effect. My one non-professional comment: Jeez! oeman50, thank you for taking the time to read it. Whole lotta GCM-ing, but perhaps not enough Global Alkalinity Modelling. They will be happy to take more funding to do this, I’m sure. Considering the warministas are advocating what is essentially a re-engineering of the climate, it is inexcusable that their evidence is not subjected to engineering standards of data quality and significance. Burt Rutan has commented in mind-numbing detail on this point – yes mind numbing even by engineering standards! You may like to spread the word amongst your colleagues, if that’s not preaching to the converted. “acidification” is a negative term which I associate with “acid rain”. I’d prefer “Lowering the oceans’ pH” but it doesn’t have the same catastrophic ring to it. The oceans are more complicated but I don’t see a little extra carbonic acid being a significant problem. The chemical content of the oceans create a massive buffering effect. Buffers resist changes in pH and tend to be quite stable. Given the small concentration of atmospheric CO2 ~ 0.06 % by mass of the atmosphere – don’t criticize me for 0.06 % instead of 0.04 % by volume – the chances of such a small insignificant trace gas influencing oceanic pH given the mass of the oceans is some 300 times that of the atmosphere. This means the potential effect of CO2 in the atmosphere is insignificant as the mass available to cause increased acidification is tiny compared to the mass of the buffer – ie the ocean. Besides if ocean acidification was really a potential threat wouldn’t atmospheric CO2 effects be negated as all of it in the atmosphere would be required to have a miniscule effect. More Junk Science – sounds plausible if you don’t think about what they are saying. Dr. Brice Bosnich is to be commended for offering a short introduction on the subject of ocean acidification. The presentation, however, is marred by some glaring omissions that are both confusing and potentially misleading to the readers of Ms. Nova’s blog. It is a shame that despite the fact that Dr. Bosnich had readers peruse the manuscript, he did not request assistance from someone familiar with marine seawater chemistry. My consultancy efforts have in the past required me to assist on environmental impact statements for coastal marine environments, including chemical changes and effects on benthic biota, including calcifying organisms such as oysters, clams, and other bivalves. Due to this, I was forced to develop a working understanding of marine carbonate chemistry. Furthermore, the influence of climate change skepticism on maintaining the status quo regarding fossil fuel energy sources has been one factor preventing wider use of nuclear power. For that reason I have attempted to maintain a current understanding of the climatic and environmental impacts of increasing atmospheric carbon dioxide, including global warming and ocean acidification. Because I am writing this a couple of days after the article was posted and likely many readers have seen it and formed their impressions (or further cemented them), I am doubtful that my contribution will be seen by many. The main reason that I am writing this is to demonstrate to Ms. Nova that should seek broader and more expert treatments of a subject as important as ocean acidification. What I am going to do here is to point out three major incomplete or erroneous sections in Dr. Bosnich’s presentation. I would be glad to continue discussion to the best of my ability, but I will note that next week I will be unavailable due to holiday activities in the United States. The first topic is the subject of dissolved carbonate equilibria. The first figure Dr. Bosnich presents is the carbonate system equilibrium diagram. Unfortunately, this diagram is for the simple system of water and carbonate species ONLY, and does not provide the actual situation for seawater. In fact, this diagram should lead one to wonder how calcifying organisms have any carbonate ion to utilize for calcification at the normal pH of surface seawater, 8.1 – 8.3. (Indeed, at least one of the comments expressed this confusion.) The actual situation can be seen simply in the following figure. 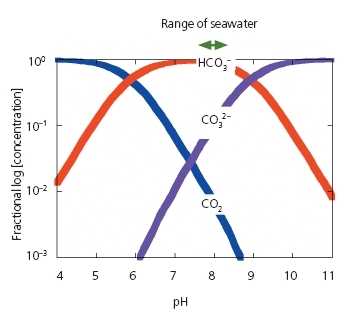 This figure shows clearly why decreasing seawater pH has a very significant effect on carbonate concentration (affecting the saturation state of seawater wrt to carbonate minerals – see below) even over the normal range of surface seawater pH. As seen, decreasing pH significantly reduces carbonate ion concentration – the equilibrium is shifted toward bicarbonate. Note that the Y-axis is logarithmic. A thorough treatment is much more complex. The following publication has a diagram of all the species in seawater which have an effect on (or which are affected by) seawater pH. The diagram of interest appears on page 23. It should be noted that the only other major contributor to total seawater alkalinity is borate ion, for which a correction is made to calculate carbonate alkalinity from total alkalinity. Therefore, the presentation should have provided a description of the actual chemical system in seawater vis-à-vis carbonate ion equilibria. The second omission regards the biogenic mineral calcium carbonate. This is only touched on briefly, but further discussion is warranted. Marine organisms form calcium carbonate hard parts with three different minerals: calcite, aragonite, and high-magnesium (high-Mg) calcite. With regard to solubility in seawater, calcite is the least soluble, aragonite more soluble, and high-Mg calcite the most soluble. Corals are predominantly formed of high-Mg calcite. Pteropods, which are important components of the food supply in polar waters, are predominantly formed of aragonite. Foraminifera and coccolithophorids are calcitic. One of the main concerns with decreasing seawater pH is not actual dissolution (though this has been observed experimentally in pteropods, which migrate vertically into waters that are undersaturated wrt aragonite. Fabry et al., http://icesjms.oxfordjournals.org/content/65/3/414.full, “Impacts of ocean acidification on marine fauna and ecosystem processes”), but it is the reduction of supersaturation. Surface seawater pH is significantly supersaturated with respect to all three mineral forms (as much as 6x). However, as the carbonate equilibria diagram shows, even slightly decreased pH substantially reduces carbonate ion concentration, significantly lowering the saturation state. This change increases the physiological demands of calcification, leading to slower coral growth rates. (Fabricius et al., Nature, http://www.nature.com/nclimate/journal/v1/n3/full/nclimate1122.html, “Losers and winners in coral reefs acclimatized to elevated carbon dioxide concentrations”. ) Note that not all calcifying organisms react the same; the concern is the overall effect on mineral-forming organisms. Therefore, reduction in carbonate saturation state is a concern for future coral reef viability even if coral reefs will not actually encounter corrosive conditions in surface seawater. (Note that incursion of corrosive seawater on the shelf of the western United States has been observed at increasing rates recently due to depth reduction of the saturation horizon, with potentially deleterious effects on shellfish aquaculture). The emphasis on actual dissolution is therefore potentially misleading, and the brevity of the discussion does not fully encompass the issues relevant to the effects on calcifying organisms. Three, a brief comment regarding the effects of acidification on “paleocalcareous” biota. The Paleocene-Eocene Thermal Maximum was a period in which a rapid injection of carbon (now attributed to destabilization of seafloor methane hydrates) to the atmosphere resulted in both dramatic global warming and equally dramatic ocean acidification. The result of this process was strong dissolution of seafloor carbonates, much shallower carbonate saturation depths, and a significant disappearance of benthic foraminifera. The authors of the study indicate that human activities could cause a much more rapid injection of CO2 to the atmosphere than occurred for the natural (though unusual) processes of the PETM, resulting in more severe impacts on surface ocean pH and marine biota. (Zachos et al., Science, http://www.sciencemag.org/content/308/5728/1611.full, “Rapid Acidification of the Ocean During the Paleocene-Eocene Thermal Maximum”). In summary, Dr. Bosnich’s presentation was not a thorough explication of the relevant issues concerning ocean acidification. As I noted at the beginning, provided that comments remain civil and constructive, I will be glad to discuss this issue with interested readers to the best of my limited abilities for the remainder of this week and subsequent to a holiday hiatus. And I’ll be glad to discuss this with Dr. Bosnich, too. Ms. Nova has my email address. pH can vary by even more than that in some places on a daily basis. But you are getting short term variation confused with long tern changes. Are you doing this on purpose to deliberately mislead people or are you genuinely unaware of the difference? This may be the first time that peer review has been used for the Jo Nova blog. Could this mean that the alarmists will now accept her, I hear you cry? The reviewers were independently selected I am … not … so sure. So therefore we should be so alarmed by a smaller incremental change over a longer time frame, if species can cope with these wider ranges of pH daily when there is no opportunity to adapt? Thanks for so succinctly making our case for us. We will make a skeptic out of you yet, Blimey. I think you may be the one who is “confused”. You seemed to have missed the point. Enduring such a change on a small time frame IS easier than enduring that change permanently. Temperature can change from 40 degrees during the day to 0 overnight. Neither extreme would be liveable conditions. I am skeptical, but not in the sense that I ignore the experts and cherry pick data in the way Nova does. That is a very clear and interesting description of the chemisry of the ocean in relation to CO2. There are two questions I have which arise from it. 1. Let’s suppose the IPCC is correct and the tempeature of the globe and hence the temperature of the sea rises, what could be the resultanf pH from the reduction in dissolved CO2 through rises in temperature reducing solubility and the increase in acidity (reduction in pH) because of increased CO2 Pressure. Thank you, Prof. Wolf, for your valuable counterpoint to the discussion. Lost in the shouting about oceanic acidification (as it properly should be called) is the fact that acidification is most pronounced at the air/water interface of the surface, since this is where the carbon dioxide dissolves into the seawater. Sadly, the surface of the ocean is also where the vast majority of photosynthesis occurs! Acidification is the PRIMARY threat from fossil fuel consumption! The earth will easily be able to tolerate a bit of warming as we are experiencing. However, collapse of the euphotic zone photosynthesis is game over, turn off the lights. It might take several decades, but that is the real risk. Sorry to spoil the party. CRS, Dr.P.H. and Professor Wolf, I have a question for you: In areas like the Gulf of Mexico we have a significant natural petroleum seeps. With the biota well adapted to consuming this raw hydrocarbon source, there must be a measurable water chemistry effect. Has this been studied? I am not a chemist but it would seem that the chemical processes while different than combustion would ultimately yield the same basic breakdown components? Rapid changes, like today, lead to ocean acidification. This is why coral repeatedly went extinct or suffered ‘crises’ in ancient times – when extreme volcanic activity, or the rapid release of methane hydrates from seafloor sediments, acidified the oceans. The Permo-Triassic Extinction: A Question of Timing | Watts Up With That? 1000,000,000,000,000,000,000,000 Joules is an rather large amount of additional heat. What could be the cause? Calculated from an estimated uptake!